It’s Mardi Gras time and the planning for another fun celebration is in full gear in the bayou town of Pelican, Louisiana. Pelican residents are buzzing about the addition of a new event this year—a controversial exhibit about the little-known Orphan Train, which transported children from the North to Louisiana to be adopted by local families in the late nineteenth and early twentieth centuries. Then a flood hits, and the body of a stranger is found behind the Crozet B & B. The police determine that the man was murdered. Fearing the effects of such a grisly discovery at her family’s business, Maggie Crozet is determined to find out who the stranger is and why he met such a violent end. Life is busy for Maggie. Her primary gig is working as a docent at a local plantation. Plus, she’s agreed to step in to replace her grandmother as a judge for the annual Miss Pelican Mardi Gras Gumbo contest, which locals take very seriously. Head judge is St. Pierre Parish Historical Society president Gerard Damboise. At her first meeting of the judges, Maggie sees why her grandmother has described Gerard as a “pompous old poop.” He insists on observing the archaic rules to the letter. Furthermore, he decrees that the Orphan Train exhibit is inappropriate and has canceled it. Faster than anyone can cook up a pot of gumbo, Maggie finds Gerard dying in his car. With his last breath, Maggie hears him say, “Lies. Secrets.” As she begins to delve into the history of her town, attempting to solve the murders, she discovers that the mysterious stranger was one of the children on an orphan train. And she realizes that there must be a link between his death, Gerard’s, and the past. The trick is to find it before she becomes murder victim number three. 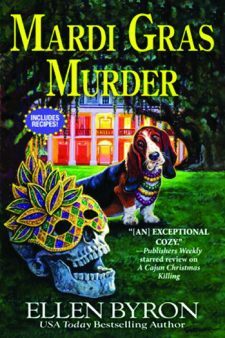 This is a welcome addition to Byron’s Cajun Country series, with its fast-moving plot and likeable characters. Lots of fun and delicious recipes, too! 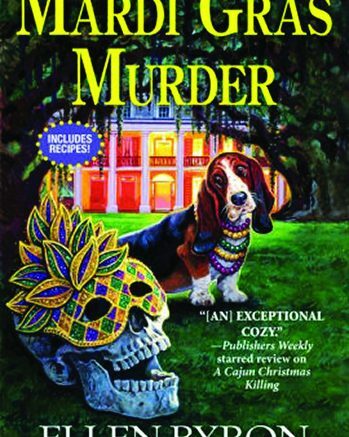 Be the first to comment on "“Mardi Gras Murder” by Ellen Bryon"